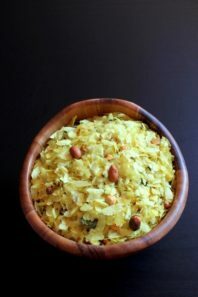 Poha chivda recipe – healthy snack recipe made by roasting the poha with few spices and nuts (peanuts, sliced coconut, dalia). Here thin variety of poha is used. This is NOT the poha which we use in making batata poha or kanda batata poha. During the diwali festival, we usually make many different snacks like farsi puri, shankarpali, crispy masala puri, tikha gathiya. And store them in dabba/container. As all of these snacks have longer shelf life, we enjoy them for next few weeks. When it comes to the snacks, I always prefer to make them at home. Just because, I do not know which and what quality oil they have used in store bought snacks. I have seen many packets ingredients list mentioned with palm oil which is a BIG NO. I would never buy those packets. So for the health reason and hygienic purpose, I prefer homemade ones. This poha chivda is a healthy snack. Because nothing is deep fried here like this poha chivda. Today’s version has all the ingredients roasted in very little oil. 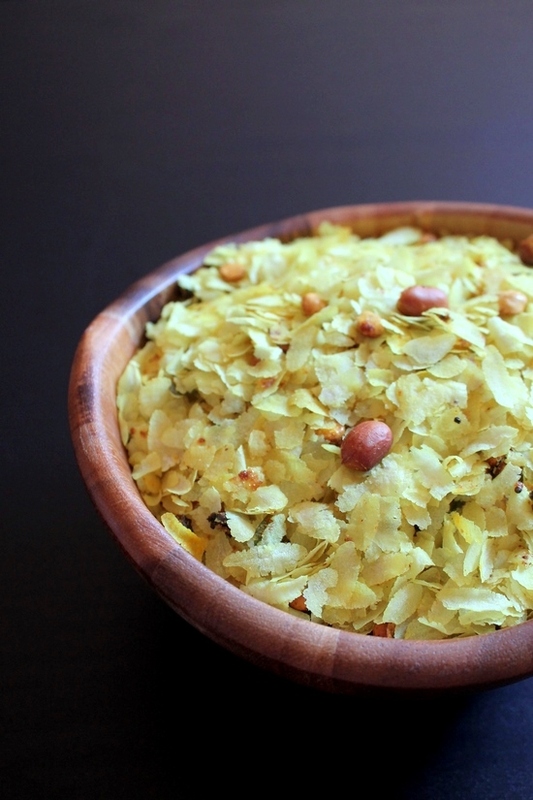 Other healthy chivda recipes on the blog – cornflakes chivda, cereal chivda. 1) First we will roast the poha. I have roasted on stove top. Heat the pan on medium heat and dry roast the poha for about 2-3 minutes with stirring constantly or till they gets crispy. No need to change the color or anything. Just make sure that poha are crispy. Remove them in another bowl. 2) Alternately, you can roast them in microwave as well. take poha in a microwave safe bowl. And microwave it for 2-3 minutes on high power. 3) In the pan, heat the oil on medium heat. Once hot, add mustard seeds and let them pop. 4) Then add chopped green chilies and curry leaves. Saute till all the moisture from chilies and curry leaves are gone and they becomes crispy. If there is any moisture left, the whole chivda will not stay crispy and over the time chivda will starts to get soggy. 5) Then add peanuts, dalia and coconut slices (if using). 6) Roast them with stirring constantly till they get light brown in color and becomes crispy. 7) Then add turmeric powder, sugar, salt and citric acid. 9) Immediately add roasted poha. Mix till everything is incorporated well. Do give this healthy poha chivda try and let me know how you like it. Serving suggestion: Serve this as a snack with cup of tea or coffee. Or you can just much on a s such any time of the day. It is good to pack in snack box for kids or adults as this is healthy. I have skipped the addition of sliced coconut, just because we do not like it in this poha chivda. But my mom always adds them. The quantity of peanuts and dalia can be adjustable as per you liking. If you like more peanuts, add more or you can reduce the quantity, simple. If you like, you can add cashews and raisins as well. For the variation, skip the citric acid and add amchur powder or chaat masala. Let’s make this chivda more healthy – substitute one cup of poha with one cup of oats. Dry roast the oats separately and mix with poha in the recipe. First we will roast the poha. I have roasted on stove top. Heat the pan on medium heat and dry roast the poha for about 2-3 minutes with stirring constantly or till they gets crispy. No need to change the color or anything. Just make sure that poha are crispy. Remove them in another bowl. Alternately, you can roast them in microwave as well. take poha in a microwave safe bowl. And microwave it for 2-3 minutes on high power. In the pan, heat the oil on medium heat. Once hot, add mustard seeds and let them pop. Then add chopped green chilies and curry leaves. Saute till all the moisture from chilies and curry leaves are gone and they will become crispy. Then add peanuts, dalia and coconut slices. Roast them with stirring constantly till they get light brown in color and becomes crispy. Then add turmeric powder, sugar, salt and citric acid. Mix well. Immediately add roasted poha. Mix till everything is incorporated well. Let the chivda cool down completely, then store them in airtight container. I always measure solid and liquid both using measuring cups/spoons. I will try to include gram measurements. But meantime you can check out this conversion chart, if that helps. Clear instructions. Easy to make. Really enjoyable outcome. Language errors need to be corrected though. Thank you. I will correct the errors. I know this post is old but I just wanted to say thank you! I JUST discovered poha and I LOVE it. I will definitely try this recipe and also look through your other recipes to see what other great things I can make. Recipes made with poha are quick and easy. 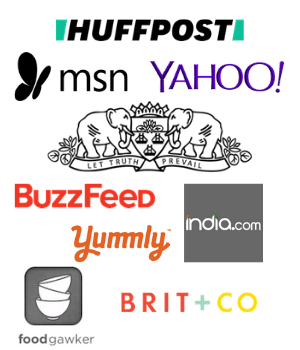 I have shared many poha recipes you can check out here. Hope this helps.